﻿﻿Who we are: Cheder is our vibrant, progressive community of families committed to leading our children's Jewish education. 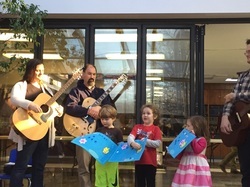 Created over 40 years ago as an alternative to “drop-off” Sunday school, the Cheder school is a parent-taught cooperative Jewish cultural school andcommunity in the greater Takoma Park / Silver Spring area of Metro D.C.
Our curriculum includes Jewish history and culture, as well as Hebrew and Torah studies. Our children range from pre-K to Bar-Mitzvah age and beyond, and we have a diverse group of parent/teachers to explore, celebrate, and transmit a sense of joy and of Jewish belonging. In addition to the school, we have an active program of adult education, holiday celebrations and annual retreats. We meet Sunday mornings near downtown Takoma Park, Maryland. Cheder, originally called Farbrangen Cheder (from farbrangen “bringing together in joy”), recognizes the diverse and rich backgrounds of all members of our community. We are a progressive, open community and we welcome all, including interfaith. gay, lesbian, and multiracial families and persons of any gender identity. The community celebrates and makes music together, works on social justice projects, and holds High Holiday services. We generally live in the Takoma Park/Silver Spring area. We aren't affiliated with any particular movement of Judaism. We are a lifelong community, with many longstanding members whose children have long since grown up but still associate with our community. We also like to eat and to sing. We pronounce our name like the "Ch" in Chanukah. Use your throat. There, you've got it. Cheder means "school" in Hebrew. This is a traditional name for our pretty non-traditional community. Each year, parents take on one role, that may be in leadership, teaching cultural classes, leading field trips, leading services (if you're comfortable with that), doing administrative stuff, whatever it takes to make our community work. We feel that the co-operative aspect of our community brings us closer. We occassionally have pot-luck dinners, celebrate Bar and Bat Mitzvahs together, and also do two community weekend retreats a year. We like celebrating our tradition together and exposing our children to a vibrant Jewish community.